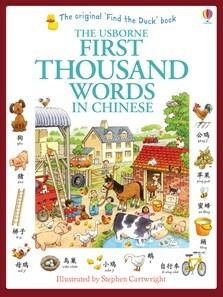 A classic bilingual Chinese (Mandarin)/English word book, illustrated with busy scenes and labelled pictures to help children learn key Mandarin Chinese vocabulary. Written in Mandarin Chinese with a standard 'pinyin' pronunciation guide in Roman letters. Includes an English/Chinese word list. Readers can hear how to pronounce every word by listening to a native Chinese speaker on the Usborne Quicklinks website. Keep dipping in to this book and your little ones will soon be able to impress people with their vocabulary. Ideal to get young people - and old - to begin the daunting task of learning Mandarin. Fun for parents and children to have a look at together, this book could be just the thing to brighten up dark winter evenings.